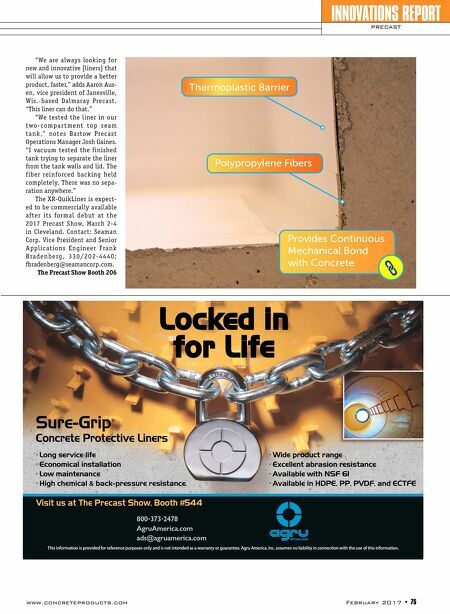 74 • February 2017 www.concreteproducts.com Precast producers have a new method of protecting concrete water and wastewater structure interior surfaces. Rigid HDPE and PVC liner systems and post production, sur- face-applied coatings considered standard in the industry are now challenged by XR-Qui- kLiner, a cast in liner system, according to developer Seaman Corp. Currently in final testing with sever- al National Precast Concrete Association producers, the prefabricated, flexible PVC/ Elvaloy-coated fabric, drop in liner suits grease/oil interceptors, septic tanks, man- holes and other components requiring chem- ical and gas-resistant protection. XR-Qui- kLiner can also be used on precast exterior surfaces. The product offers chemical and gas protection via the custom formulated PVC/ Elvaloy layer. Bonding to the precast compo- nent is achieved by utilizing an integrated polypropylene fiber backing, creating a layer of fiber reinforced concrete that structural- ly locks the liner in place. The liner's struc- tural capacity can accommodate (potential) through cracks of precast component walls without loss of functionality. 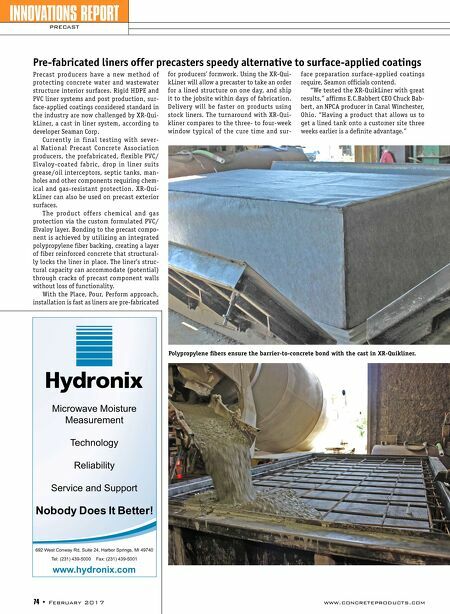 With the Place, Pour, Perform approach, installation is fast as liners are pre-fabricated INNOVATIONS REPORT PRECAST Pre-fabricated liners offer precasters speedy alternative to surface-applied coatings for producers' formwork. Using the XR-Qui- kLiner will allow a precaster to take an order for a lined structure on one day, and ship it to the jobsite within days of fabrication. Delivery will be faster on products using stock liners. The turnaround with XR-Qui- kliner compares to the three- to four-week window typical of the cure time and sur- face preparation surface-applied coatings require, Seamon officials contend. "We tested the XR-QuikLiner with great results," affirms E.C.Babbert CEO Chuck Bab- bert, an NPCA producer in Canal Winchester, Ohio. "Having a product that allows us to get a lined tank onto a customer site three weeks earlier is a definite advantage." Polypropylene fibers ensure the barrier-to-concrete bond with the cast in XR-Quikliner. www.hydronix.com 692 West Conway Rd, Suite 24, Harbor Springs, MI 49740 Tel: (231) 439-5000 Fax: (231) 439-5001 Microwave Moisture Measurement Technology Reliability Service and Support Nobody Does It Better!